The Roles and Permissions Pro add-on for Event Espresso expands upon the features included with the Roles and Permissions Basic add-on. Need to Buy a Support License for the Roles and Permissions Pro Add-on? Download the latest version of the Roles and Permissions Pro add-on for Event Espresso 3 from your Event Espresso account. This add-on requires the Roles and Permissions Basic add-on to be installed and activated. Have you already read through the documentation for the Roles and Permissions Basic add-on? If not, you can view the documentation for the Roles and Permissions Basic add-on. 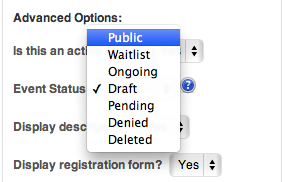 Then continue to the sections below to learn about the new options in the Roles and Permissions Pro add-on. In addition to the standard Minimum Page Permissions, there are now two new boxes in the User Permissions page: Current Roles/Capabilities and the Advanced Options section. This section lists what the different roles can do and the number of users with that particular role. Clicking the links takes you to the Users page which will show only those users with that role. 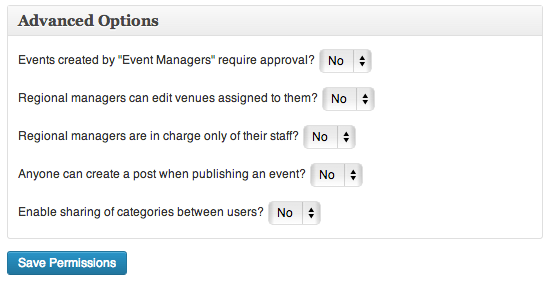 Events created by “Event Managers” require approval? : Selecting yes will mean the Admin will need to authorise an event created by Event Managers, before it will be published and go live. If set to No, the events will be published as normal. Regional managers can edit venues assigned to them? : Gives Regional Managers the ability to edit and delete venues assigned to their locale. Note that the permission for Venue Manager must be set at Regional Manager level. Regional managers are in charge only of their staff? : If set to yes, staff added by other users will not be visible to the Regional Manager in question. Anyone can create a post when publishing an event? : Setting to yes will remove the Post section in the edit Event page. Enable sharing of categories between users? : Allows categories to be shared with all staff. If set to no, categories will be on a per staff member basis. Create and manage multiple regions and areas where your events occur, for example USA, UK, Finland or right down to a local level like Salt Lake City, Bountiful, Ogden. Adding a new locale is simple. Start by clicking the Add New Locale button. In the box that appears, add the locale name and click the Save Locale button. This new menu will list all of your Regional Managers, and you can obtain important contact information and edit which regions they deal with. Hovering your mouse over the Regional Managers name will reveal the edit link. 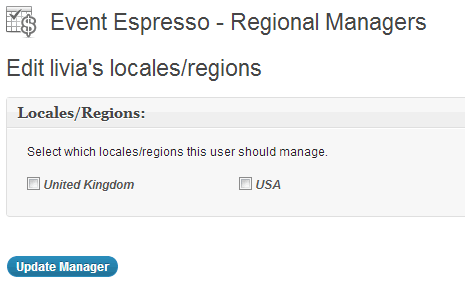 Click that to edit which regions that manager covers, if any. The Roles and Permissions Pro adds additional features to Event Espresso 3 by expanding on the options introduced by the Roles and Permissions Basic add-on. Are you running a current version of Event Espresso 3? Is the Roles and Permissions Basic add-on installed and activated? Some options mentioned here are not appearing. Can you help? This add-on requires the Roles and Permissions add-on to be installed and activated. It cannot run alone. Please ensure that both add-ons are up to date.